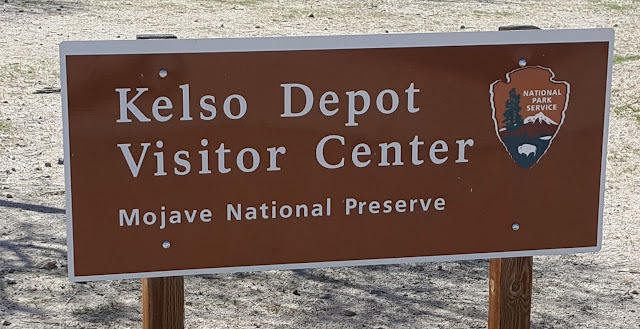 From Hole in the Wall Campground in the Mojave National Preserve, we take a left to follow the dirt road for about 13 miles and then paved road to Kelso Cima Road. The road had recently been graded , so it was in good shape for Lady Blue. 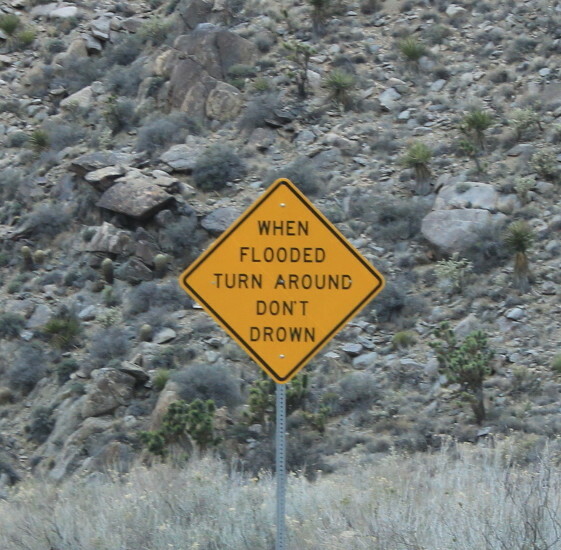 Thank heavens it hadn't rained recently. Very few vehicles on this road. But a nice surprise was a large section of Joshua trees. The Kelso Depot seems to sit in the middle of nowhere. 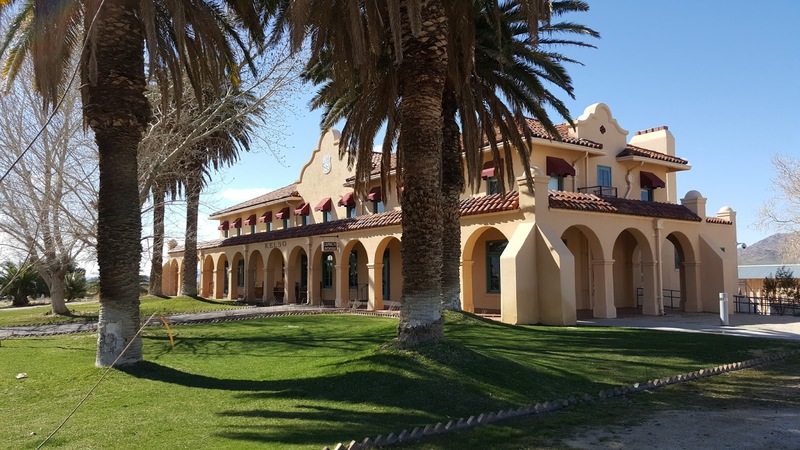 But this was a needed stop for the Union Pacific Railroad on the way to Las Vegas and beyond. 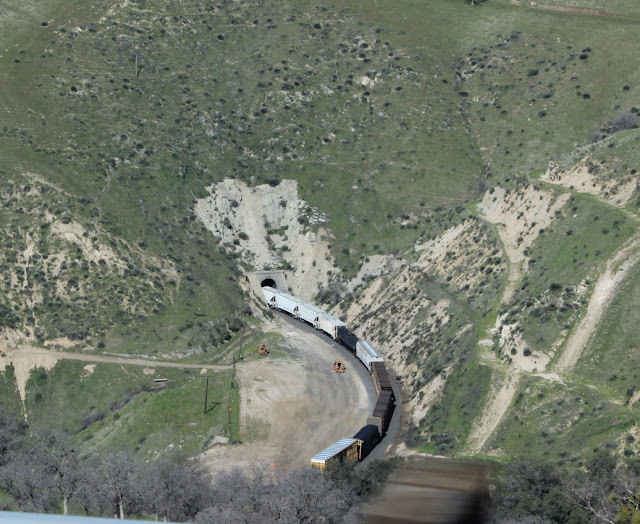 They had to add a locomotive to climb the steep incline from Kelso to Cima. The restaurant section is now part of the gift shop. Makes you want to hop on a stool and order a shake or something. 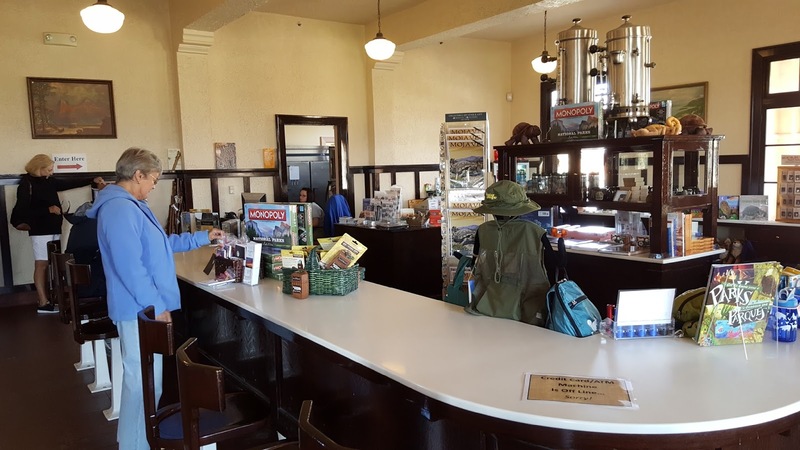 The station had quite a few displays about railroad history. Afterwards, we head south towards Route 40 , going past the Granite Mountains. Once on Route 40, we head west again towards Barstow. 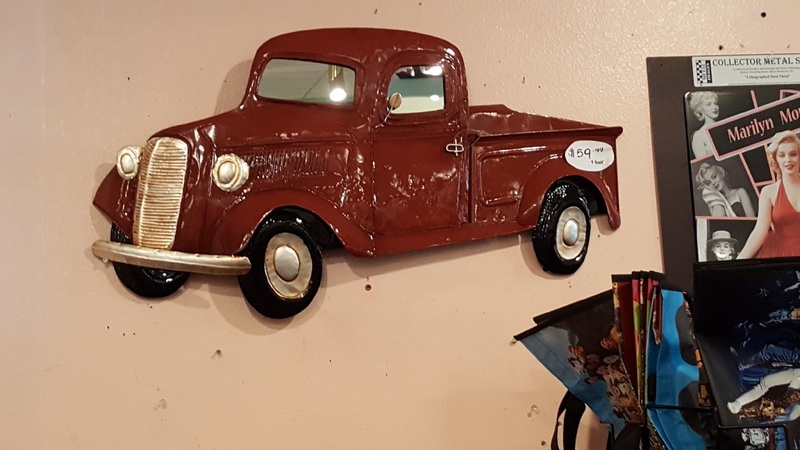 Before the city, we exit onto old Route 66 into Yerma and Peggy Sue's 50's Diner. 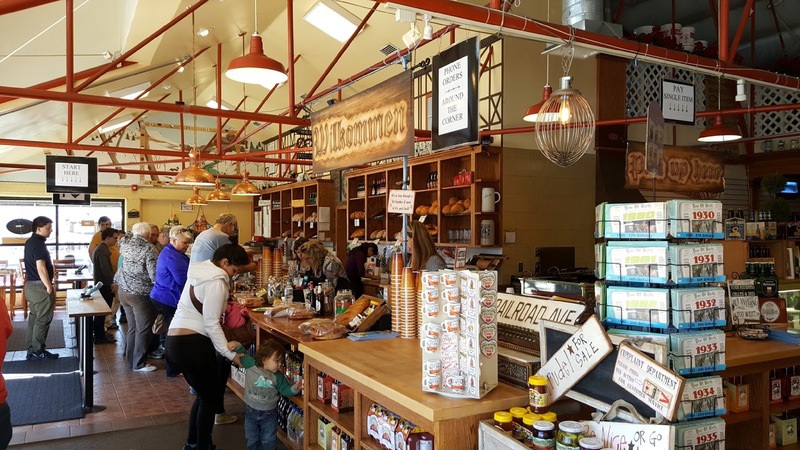 This is a stop that is part of our Harvest Hosts membership that allows us to camp for free at a number of businesses that are mostly farms. Our first stop back in 2013 was at an Alpaca farm in New Mexico where we were just in time for the shearing. This stop is simply a roadside diner, but a unique one. Without the Harvest Host guide, we probably would never have found it. 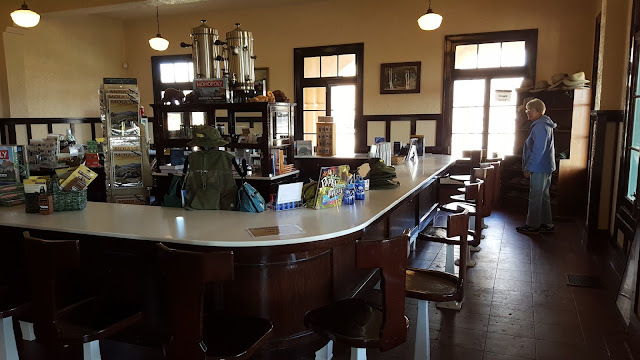 The owners had worked at Knotts Berry Farm and in the movies. 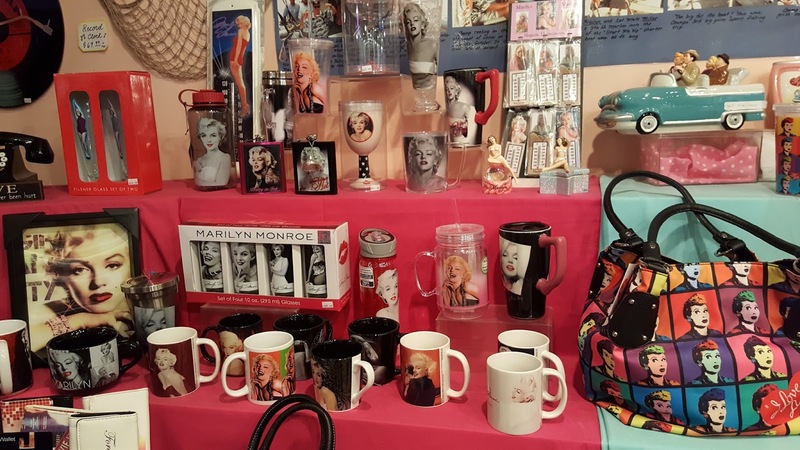 That background gave them access to a lot of memorabilia such as signed pictures of stars like Elvis. Or, how about Annette Funicello(signed) and Timmy from the Mouseketeer Club. Really???? How many remember the Mouseketeer Club? 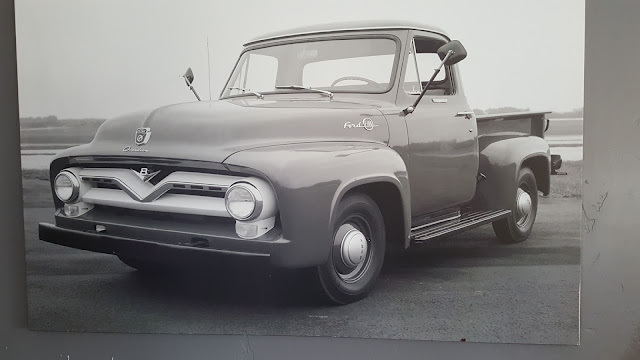 "Who's the leader of the club that's made for you and me? The attached gift store has a large selection of memorabilia for stars like Marilyn Monroe, Lucille Ball, and Audrey Hepburn, among others. A nice selection of antique lunch boxes too. 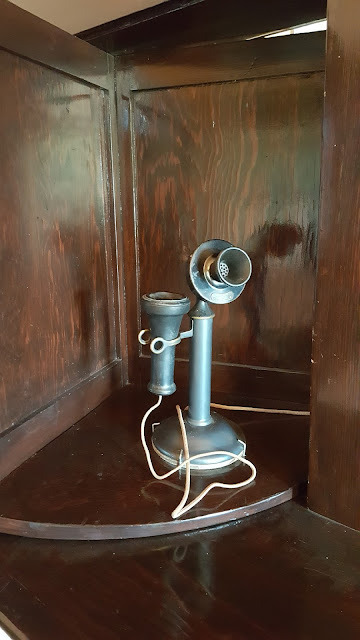 Odds and ends as well. 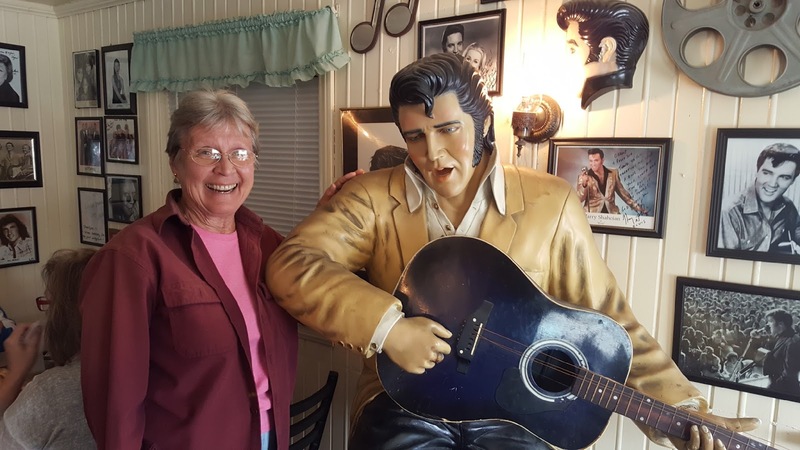 The food was diner style, whatever that means to you. But, it was good diner food. Even a dinosaur park in the back. What kind of dinosaur kids(of all ages)? The bottom line is that you don't have to belong to Harvest Hosts to stop overnight here. This is also a well know trucker stop. But the parking lot is huge and you can have a very quiet night--we did. And, as we said, we never would have stopped here without the Harvest Hosts Info. 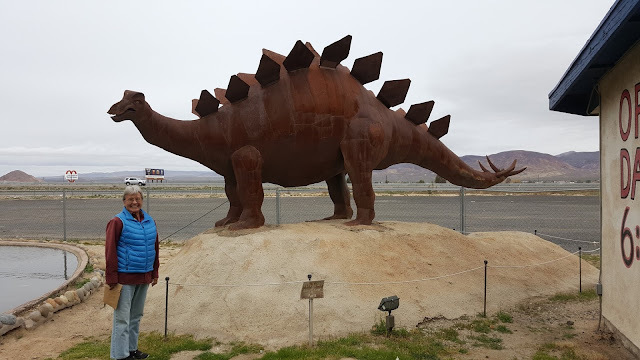 From Peggy Sue's, we jump on Route 58 west to Route 395 north to Inyokern and then south on Route 14 to Red Rock Canyon State Park. Why so far out of the way? We wanted to try a little of this part of Route 395 and we wanted to see a bit more of this area before we left the high desert. 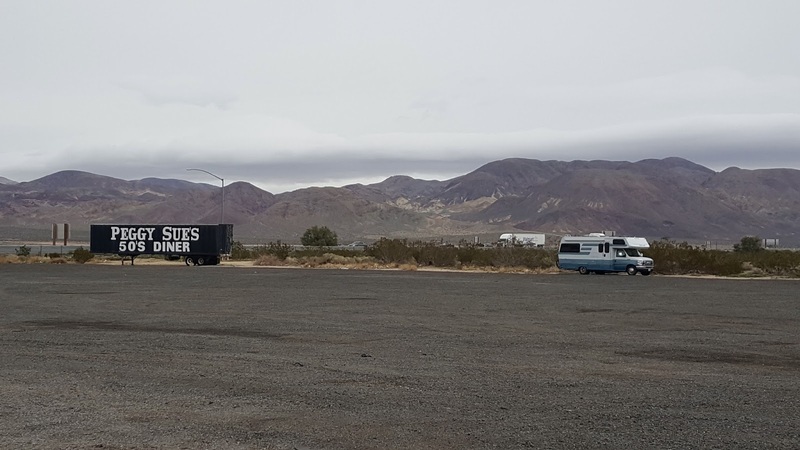 Turned out to be a scenic , interesting ride, with some nice views of snow capped mountains around Inyokern. Along Route 14 you never expect to see these rock layers of color. They just jump out all of a sudden. The rangers said that this is mostly sandstone rock with iron in the sandstone. 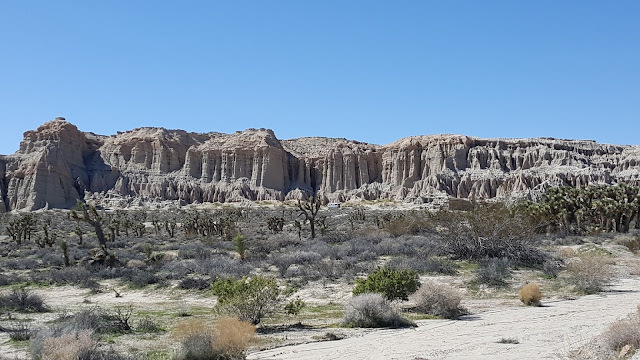 The weather over thousands of years has worn away parts of the rock to leave big red boulders and light colored sections that remind you of drip castles at the beach. By the way, can you find Lady Blue in the center of the picture at the foot of the rocks? 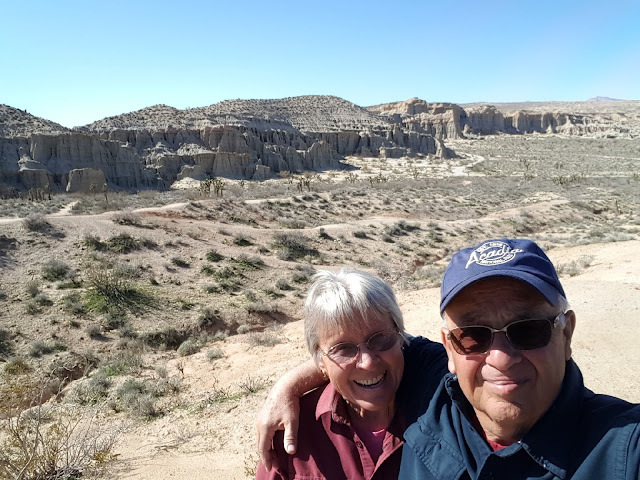 Jan and I climbed up a trail to the top of the cliffs. Lady Blue is way in the distance. 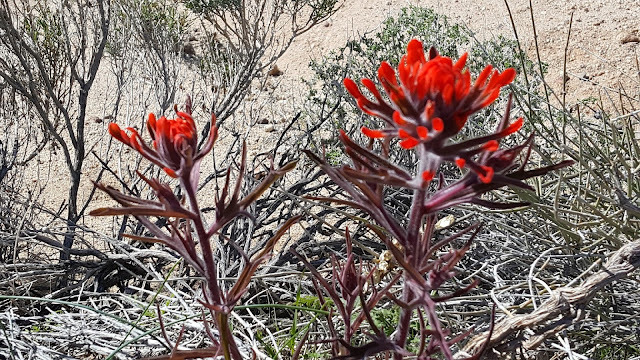 On the trail, some Desert Paintbrush. 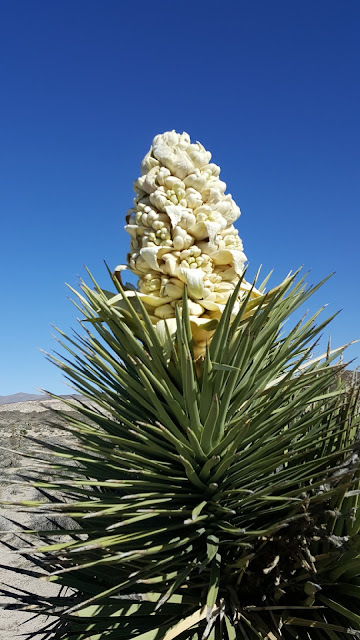 Here, we find a Joshua tree in bloom. Jan is thinking these cliffs are gigantic. 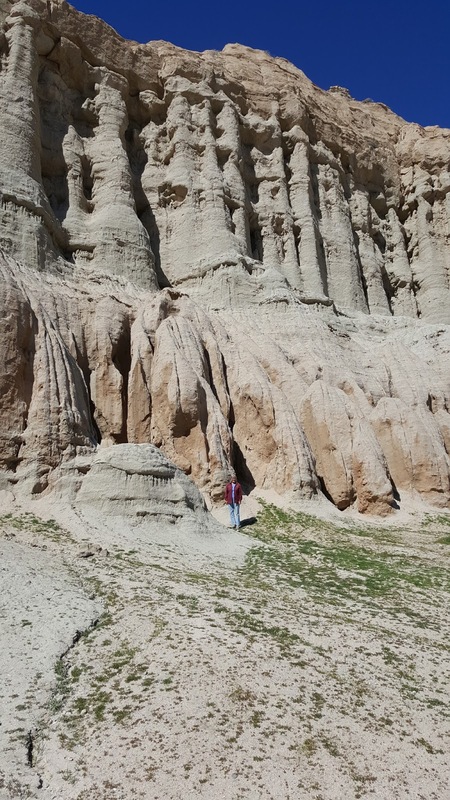 If you look closely, you can see her at the base of the cliff. The campsites are spaced quite well. Dry camping. 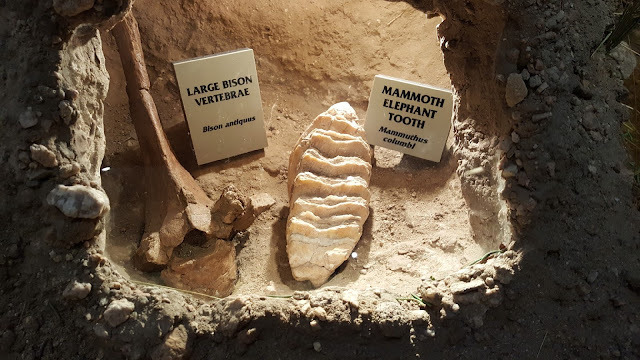 The small visitors center does have some good displays of fossils gathered in the area. That is one large Mammoth tooth!!!! 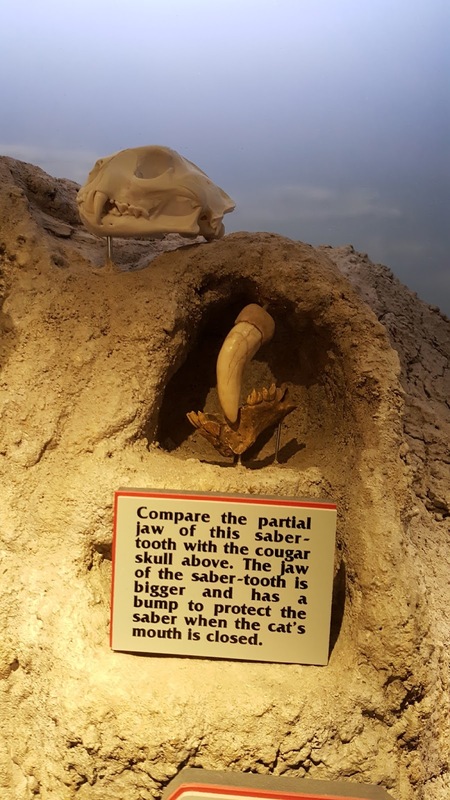 As the picture says, compare the Saber tooth to the skull of the cougar above it. 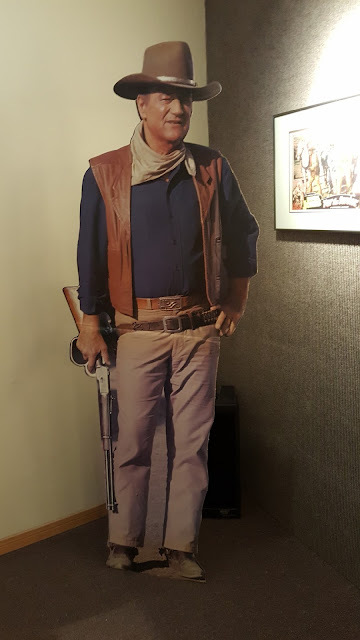 John Wayne sure gets around. Just to let you know that a lot of pictures were filmed here. 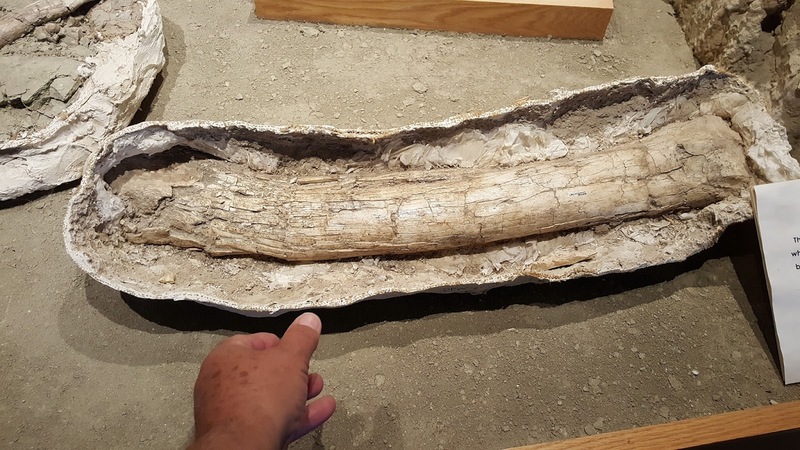 A lower leg bone from a giraffe like animal. From Red Rock we head south to Route 58 and then west again towards Bakersfield. 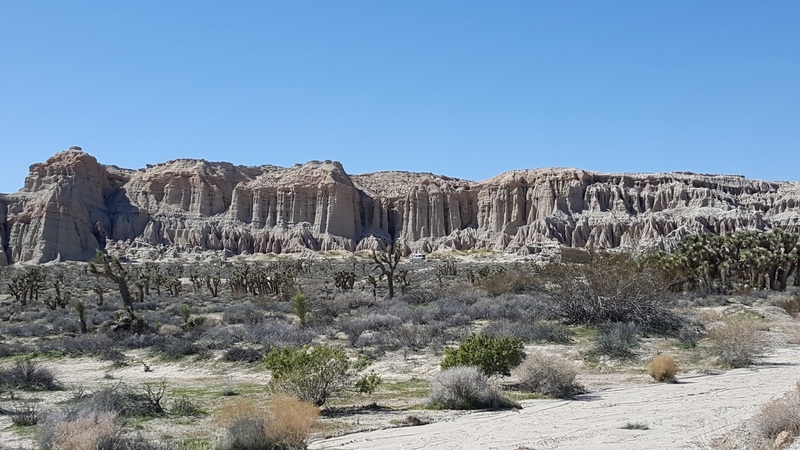 The landscape begins to change with signs of more year round moisture and sense of leaving the high desert. 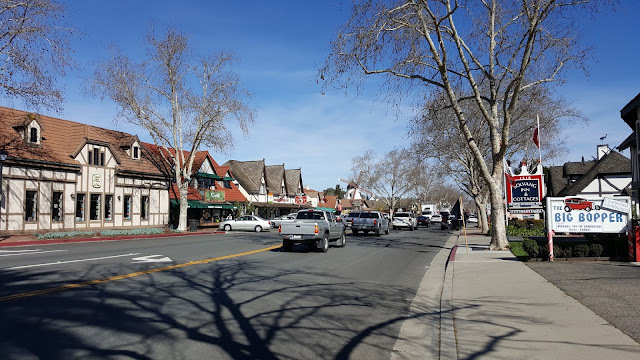 Along the way is a quite beautiful small town of Tehachapi. People here were extremely pleasant. We know you will find this hard to believe, but Bruce saw a sign on Route 58 for a Kohnen's Bakery. 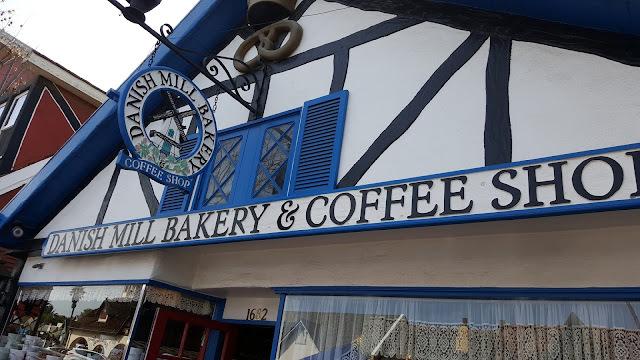 Of course, we exited and found a wonderful, well designed and maintained town with a superb German bakery. We find a number of towns across the country who support large murals on their town buildings. This mural describes parts of blacksmithing. 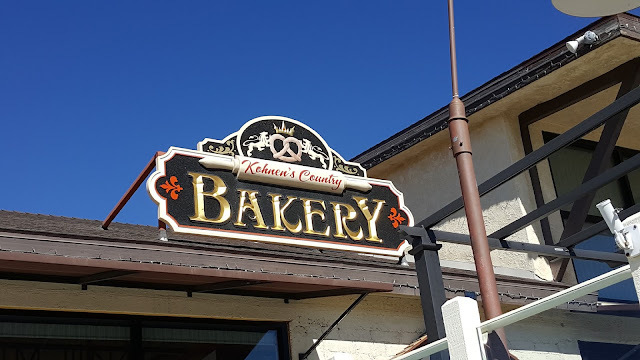 The bakery is at about 4,000 feet elevation. Continuing on Route 58, we see many wind farms and also the railroad. And, even though we are still a bit south, examples of snow covered mountains. And--looking up sometimes or looking down, we catch some of the many railroad tunnels. Obviously, an active railroad line. We do not make reservations , as a rule. This was a good reason. We were heading for Bakersfield and had a few campgrounds in mind from our camping app and campground reviews. But, once again, Bruce saw a sign that said California Fruit Depot. This was after we had passed miles and miles of citrus groves. So, off we go. 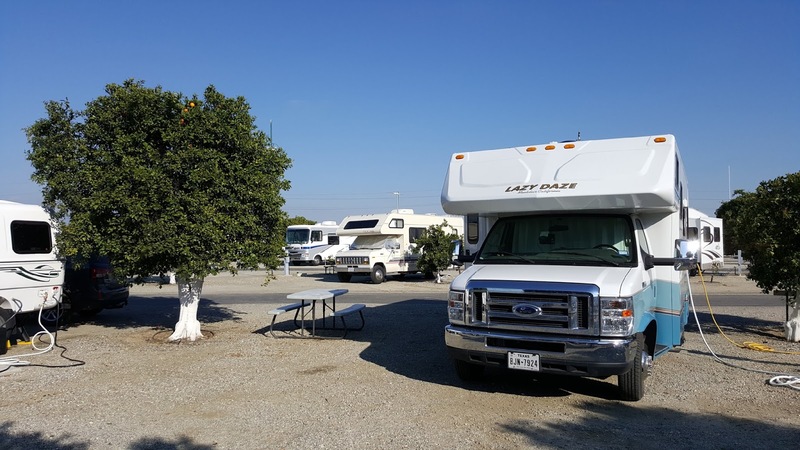 And , not only do we find a great citrus warehouse at the groves, but also a great RV park near the grove. 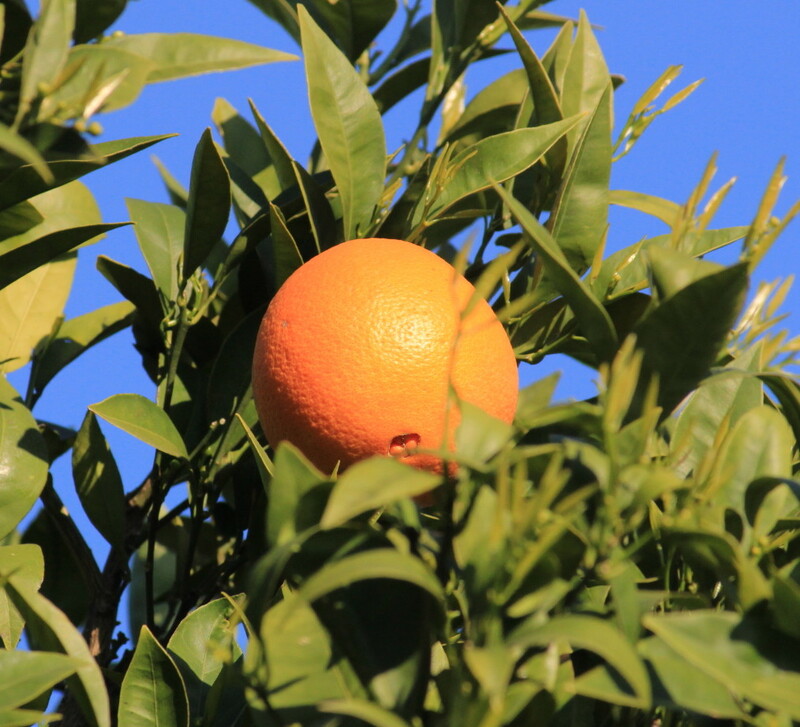 This orange is one of many near our RV. The sites are surrounded by orange trees--a few left on this one. 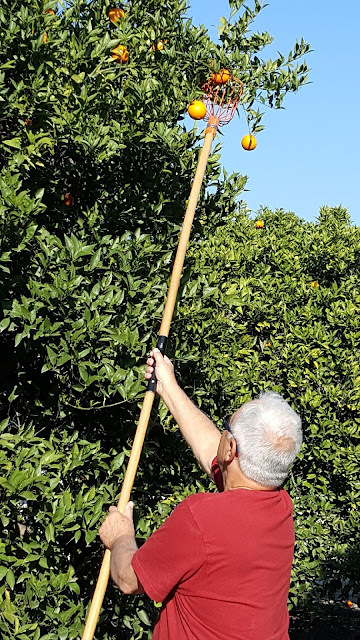 Even though it is the end of the season--the trees have new growth and the blossoms are showing and will open in a few weeks or sooner--there are plenty of oranges at the top of the trees. 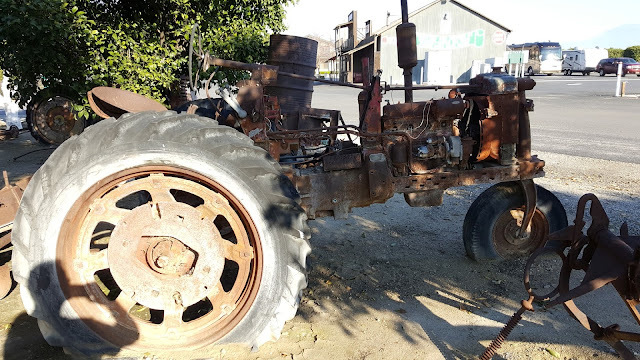 Another quite old tractor. This time all I could find on the skeleton was part numbers here and there. From Bakersfield, we head west on Route 58 to Route 99 south and then Route 166 west over the mountains to Santa Maria and Route 101. Now we are definitely west of the high desert and each mile brings greener and greener landscape. Besides left over signs of recent flooding, we note that the ponds and lakes seem quite full. 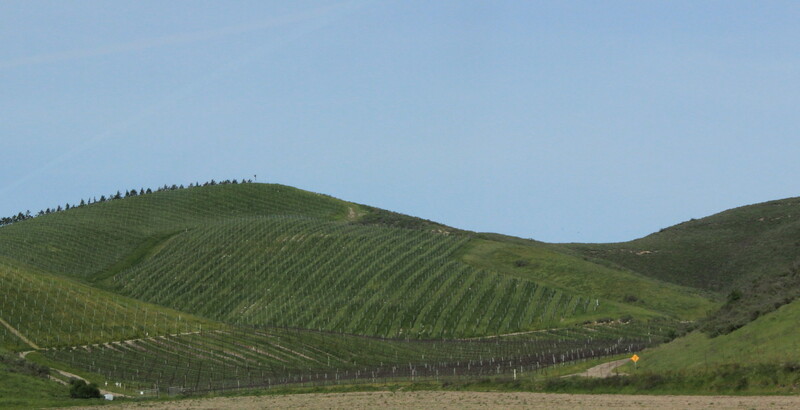 The vineyards begin to multiply. Though the grass is green , the vines are still dormant. Some of the homes are--shall we say-- a bit larger. 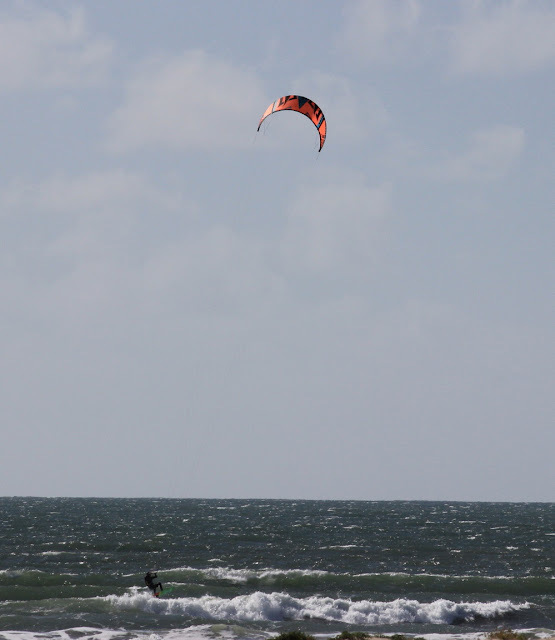 At Santa Maria, we hop on Route 101 south to Buellton and stop in at Flying Flags RV Resort. We stop here because it is at a perfect spot to visit Solvang and Los Olivos which are great towns to visit for bakeries, walking, and wine tasting. Flying Flags is under new management since our last visit. The park is growing in size and cost. 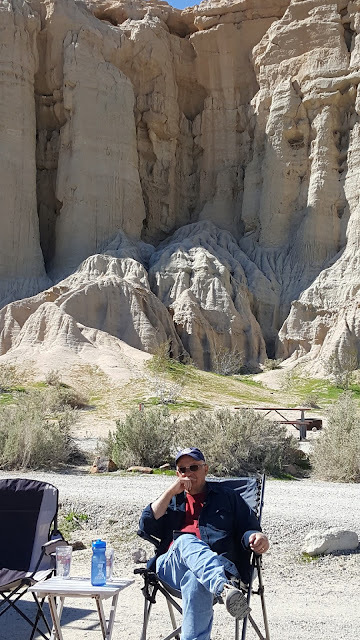 Our last stay was in dry camping with a great view for $25. This time it was $64 for one night. Big change. But, it is still in the perfect location for this area. 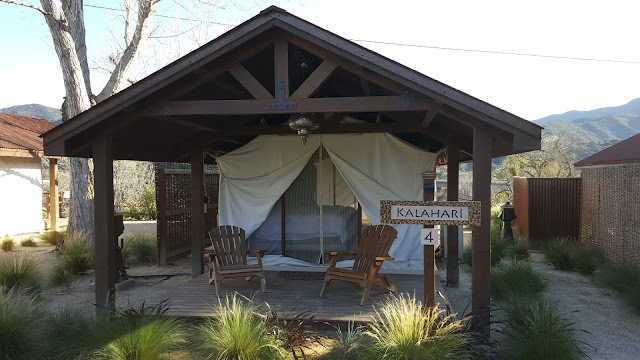 The above picture is of one of their "rental tents". Not your usual tent or rental yurt. The campground now offers concerts on weekends and barbecue and chile fests and wine tasting. 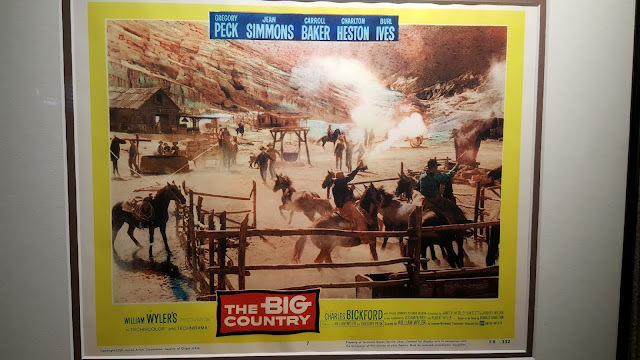 Thought Clifton might appreciate this picture in the guest lounge. We thought this would be worth a chuckle. 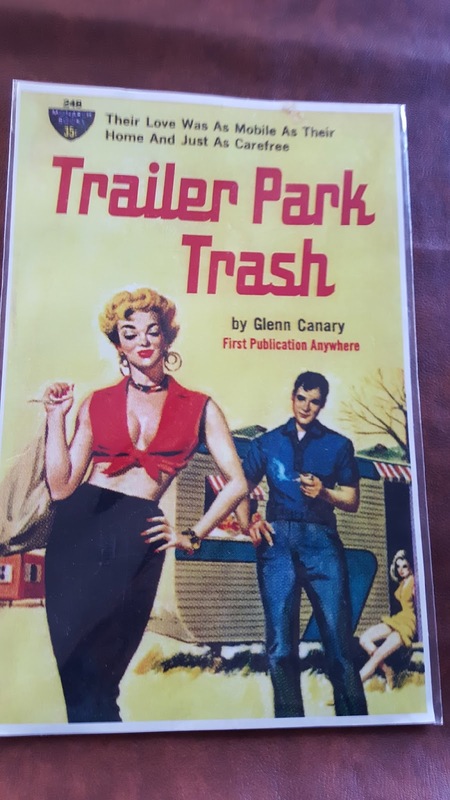 We know some of our friends and such may still think we are close to trailer trash. Catch the top of the poster--"Their love was as mobile as their home and just as carefree". Whoa!!!! Hold on there!!! 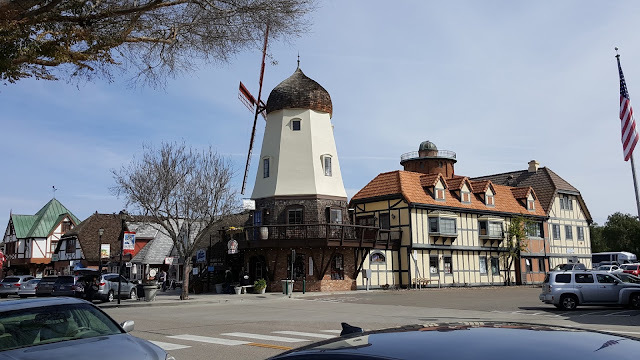 Solvang is a pretty town just a few miles south of Buellton. It prides itself as a Danish Village. 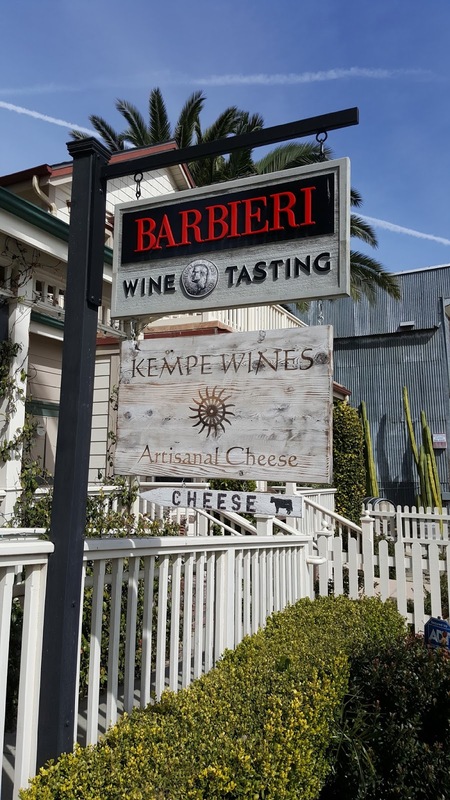 A definite tourist stop with plenty of pastry shops, restaurants, and wine tastings. 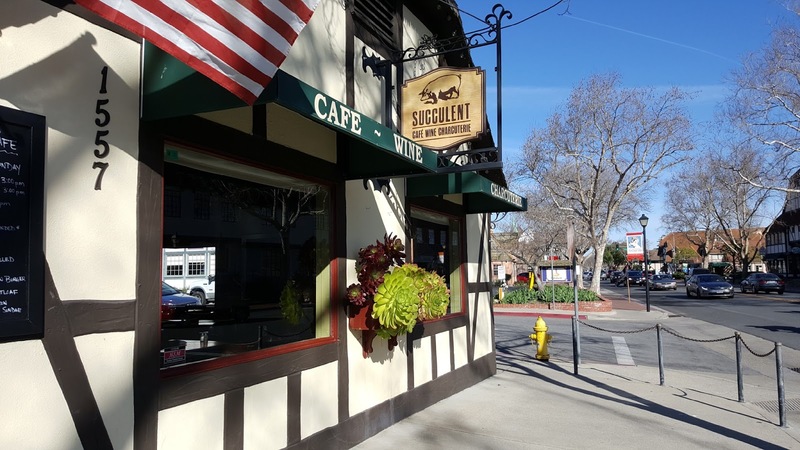 Also, a great place for a pulled pork sandwich, a pastrami, and a glass of local Pinot Noir. Jan and I had a great visit to Casa Cassara. Nice talk with the owner ,Dan. and a bit of his family history. Cliff and Vicki might like to know that he is also a motorcycle fan and owns a Harley that sounds exactly like yours. Yes, we bought a few bottles. A bonus was the discovery of Dr. J's Bicycle Shop. We needed some parts replacement and maintenance on our bikes that we were not able to do. They took both of our bikes, did a great job, and we picked them up the next day. Perfect. 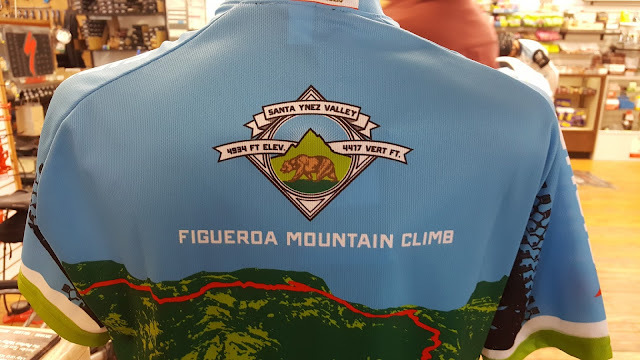 Thought that Marsha and Mark might like this shirt in the store for a mountain climb. That's a 4,900 foot elevation and 4,437 vertical feet. Sound like fun? 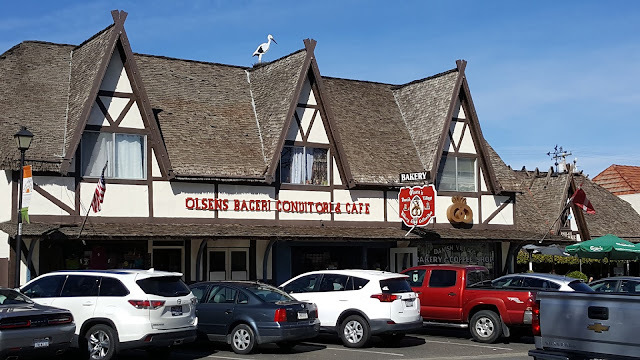 And, of course, one more bakery. One could really!!!! gain weight here. The windmills in town heighten the Danish heritage look, but they are just nice to see. After picking up our bicycles, we head back northeast on a pretty country road to Los Olivos. We enjoyed a nice walk around the small town. 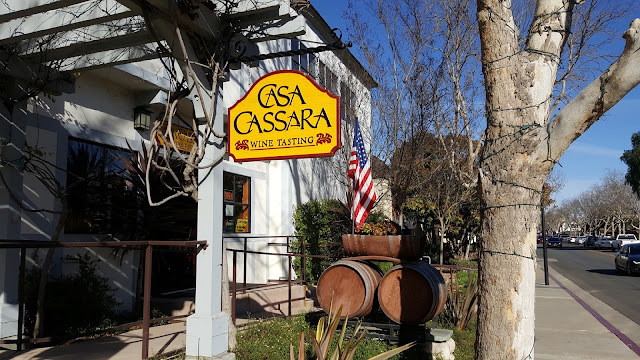 And, this time, we decided to try a different wine tasting. We stopped at Barbieri and Kempe wine tasting. One attraction was certainly the local artisinal cheese and local salami. 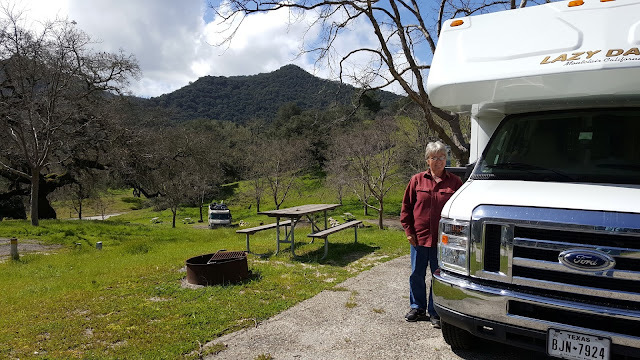 From Los Olivos, we head north on Route 101 to Arroyo Grande and then over to Lopez Lake Recreation Area, a county park and campground. 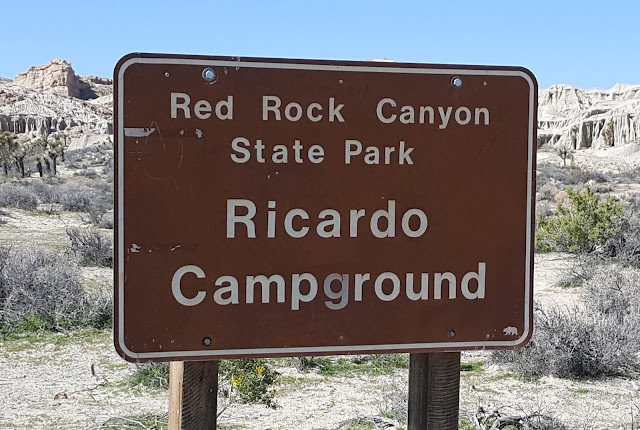 An interesting campground. There are no views of the lake from the sites and many sites seemed very close together on this weekend. We came here on a Saturday night, thinking the coastal camps would be full. We found a great, level site with surrounding views of green hills. 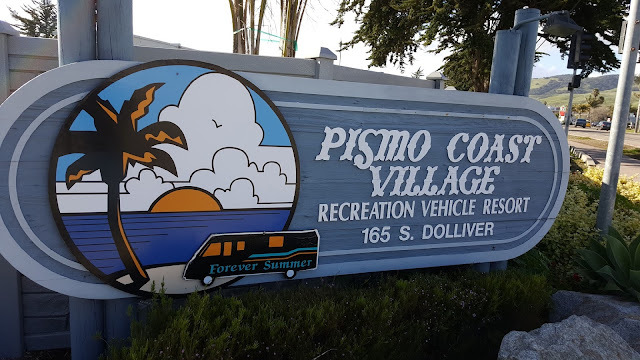 On Sunday, with better availability on the coast, we head the few miles over to Route 1 and Pismo Coast Village RV Resort. Actually, we were heading for North Pismo Beach State Park, but when we arrived, the park was closed, evidently for damage from the recent storms and downed trees. 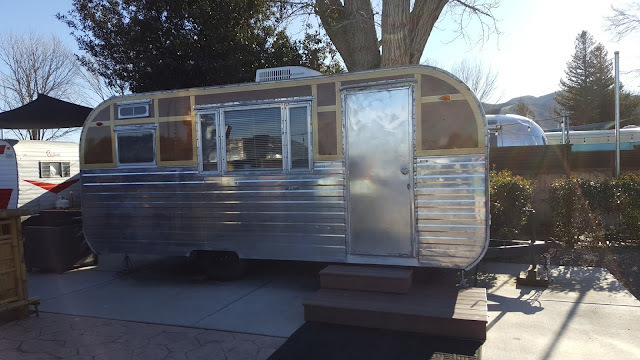 But, right next door was Pismo Coast with great access to the beach and water views. 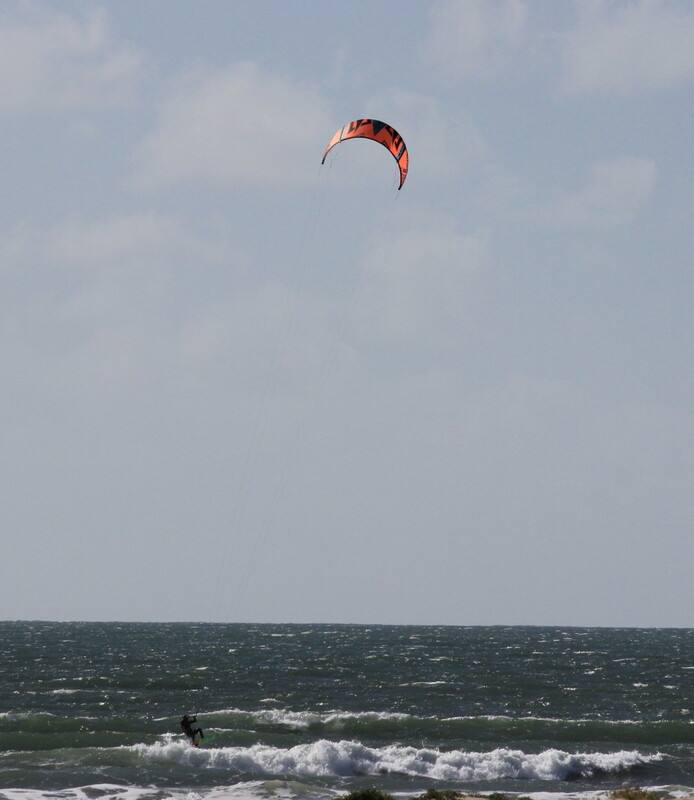 Seemed a little cool, but that didn't stop the kite surfers and regular surfers. Nice flowers like Bird of Paradise. The beach flowers almost look plastic. We would assume the waxy look is to preserve moisture. 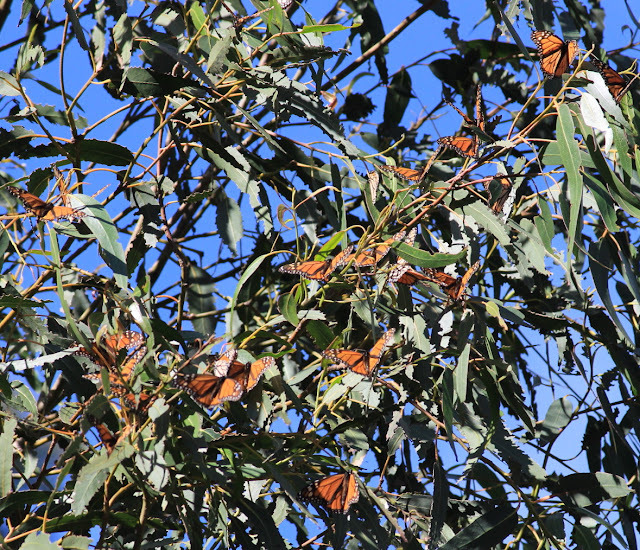 Part of Pismo State Park is a Monarch Butterfly reserve among some very tall Eucalyptus trees. This is the end of their stay here. Evidently they arrive starting in November and stay through February. And here we are in March. But there are still a few around. Here is a group of about 14 or so. So nice to see so many in one place. 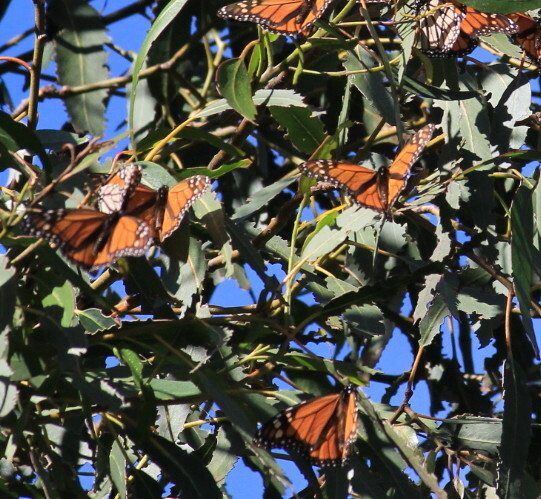 We did not see very many on our trip south and west this year. Worrisome! This is a picture from our campsite. These homes all have a view of the ocean. We will assume the price reflects the view. Our first night featured quite a few clouds passing through. But, they parted enough to allow a wonderful Pacific Ocean sunset! What a nice welcome to the Pacific California coast.